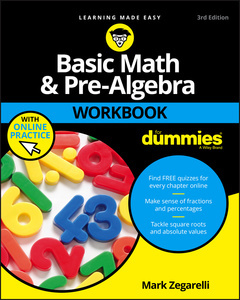 Basic Math & Pre–Algebra Workbook For Dummies is your ticket to finally getting a handle on math! Designed to help you strengthen your weak spots and pinpoint problem areas, this book provides hundreds of practice problems to help you get over the hump. Each section includes a brief review of key concepts and full explanations for every practice problem, so you′ll always know exactly where you went wrong. The companion website gives you access to quizzes for each chapter, so you can test your understanding and identify your sticking points before moving on to the next topic. You′ll brush up on the rules of basic operations, and then learn what to do when the numbers just won′t behave negative numbers, inequalities, algebraic expressions, scientific notation, and other tricky situations will become second nature as you refresh what you know and learn what you missed. Each math class you take builds on the ones that came before; if you got lost somewhere around fractions, you′ll have a difficult time keeping up in Algebra, Geometry, Trigonometry, and Calculus so don′t fall behind! This book provides plenty of practice and patient guidance to help you slay the math monster once and for all. Once you get comfortable with the rules and operations, math takes on a whole new dimension. Curiosity replaces anxiety, and problems start feeling like puzzles rather than hurdles. All it takes is practice. Basic Math & Pre–Algebra Workbook For Dummies is your ultimate math coach, with hundreds of guided practice practice problems to help you break through the math barrier.